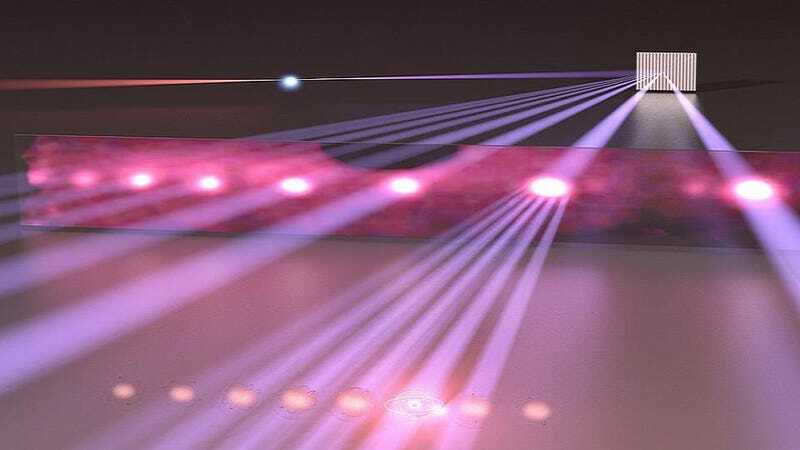 Using ultra-fast pulsing lasers, scientists have managed to split ultraviolet light into separate frequencies, put them equal distance apart, send them shooting across a lab, and use them to measure atomic clocks. The Joint Institute for Laboratory Astrophysics is pleased to announce that they've invented a technology that sounds like a hair product from the nineties. They're even more pleased to announce that the Extreme Ultraviolet Frequency Comb is going to set atomic clocks straight, help with spectroscopy, and just generally make the world a cooler place. Optical frequency combs are one of the lesser-known, but cooler applications of advanced laser technology. They look like the picture above — a group of lasers shot across a space parallel to each other, if the comb went across a wide spectrum. The comb separates finely distinct frequencies of light and shoots them out in bands. It does this by an interesting wave phenomenon; using waves to make pulses. A regular standing wave has a bunch of peaks and valleys, each of them mild and regular. Add in another wave, one with a slightly different frequency, to slosh around with the first. Let's say that every three peaks of the shorter wave coincide with the peak of the longer wave. At that point, the waves build to a larger peak. At other points, they interfere with each other, messing with each other's amplitude. There are still peaks and valleys in the waves, but there is a larger wave, a pulse, that peaks every three of the shorter wavelengths. Now add another wave to the first two. It will also combine its peaks and valleys with the other wave, and will create a new pulsing frequency. With more waves, carefully added, the pulses will become shorter, more widely spaced, and more distinct. A regular laser emits waves all in phase and of the same frequency. A mode-locked laser, used to make combs like these, takes many different waves mixes them carefully by using a series of mirrors, and emits them as the pulses described above. The more frequencies of waves used, the shorter the pulses are and the longer the gaps between them. The frequency of the pulses form the teeth of the comb, and scientists have been using them to measure precise frequencies of light. They're used in astronomy to measure the exact frequencies of light coming in. Each molecule or atom, when it gives off light, emits and absorbs very specific frequencies. By precisely measuring the frequencies given off, or absorbed by, heavenly bodies, scientists can understand exactly what the chemical composition of faraway stars and planets are. They can also isolate the frequencies of atoms here on earth, specifically, of atomic clocks. Atomic clocks, built to measure time in the oscillations of certain atoms, can be run in the microwave, visible, and ultraviolet light spectra. It's tough to compare the different spectra and frequency combs let scientists manage it. They are like a "ruler" for light. Until now, the pulse was only in the visible and low ultra-violet spectra. Because it takes a broad range of overlapping frequencies to get a shorter pulse, making a pulse in the ultraviolet range was a challenge. The Extreme Ultraviolet Frequency Comb starts with infrared lasers, and pumps them back and forth in a chamber. The chamber then floods with xenon gas. The light occasionally knocks an electron off the atoms of the gas, and when the electron falls back into place, the laser sends out a pulse of a few hundred attoseconds duration. An attosecond is 0.000000000000000001 of a second. The result was not just a better comb, but a comb in which each of the teeth was split off into many different harmonic frequencies. In other words, each of the teeth of the comb was another comb. The comb got meta. The ultraviolet comb will be used to keep the clocks running on time - at an atomic level. It will also be only a stepping stone to another, more advanced technology. The next step? An X-ray comb. Top Image: Baxley/JILA. Second Image: Bio Info Bank. Via Nature, Science Blogs, and NIST.